Wash and dry meat. Sprinkle with spices. Do not add salt or the meat juices will be drawn out. Heat a frying pan. Add oil and butter to pan and heat until just bubbling. Add fillet and sear on all sides to keep in juices. Now fry the fillet until well browned and cooked. Do not overcook or the meat will be dry. Add water when necessary to make sure that the meat does not burn. Add salt, turning the meat to make sure that the salt is distributed. Cook until done. Remove meat to foil and wrap to cover. Allow to rest for 10mins before slicing. Meanwhile, add water to meat juices in pan to deglaze. Scrape loose any meat pieces and allow to simmer until reduced. Add cream and stir. Taste for seasoning and remove from heat. Slice meat. 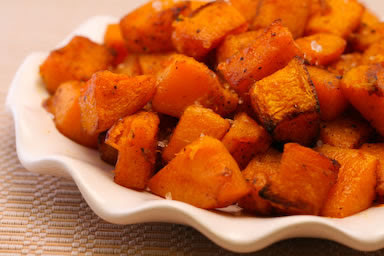 Place on top of roasted butternut. Ground pepper over meat. Spoon sauce over. Steam corn spears and keep aside. Place caramelised onions, baby corn and courgettes on the side. Serve with a crisp salad.